Perfect home for privacy! 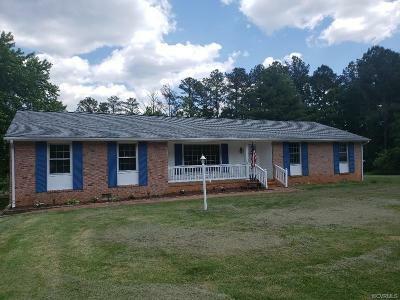 This 4 bedroom, brick rancher sits on a cleared 8.13 acre parcel surrounded by trees. The paved driveway leads to additional paved areas around the carport, storage building, and 4+ car garage. In addition, there are three large chain link dog kennels. An inground pool has been filled and used as a garden plot. Along with all of this, the home is beautiful with hardwood floors, new carpet in some rooms, tile in two bathrooms, new vinyl in the kitchen and half bath. The fireplace in the family room has a wood stove insert for cozy living on those cold days and nights. From the driveway there is easy access to the side door, laundry area and kitchen for unloading shopping bags and groceries. French doors help keep the home light and bright with good traffic flow for entertaining. Sliding glass doors from the family room access the covered, concrete patio for outside entertaining as well. This could be the perfect home for you. Call to make your appointment to see this great home in the country. More pics coming soon.